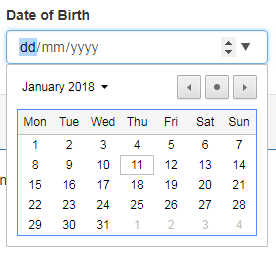 Why is not a good practice to use the browser built-in DatePicker control : This is because the implementation of datepicker is different from browser vendor to vendor. This means our end users may have different experience depending on the browser they use. Let us understand this with an example. Notice we have set the input element type to date. At this point if we run the project and navigate to http://localhost:4200/create in Google chrome, we see the date-picker as shown below. Now, if we navigate to the same url in firefox, we see a date-picker control that is very different from the date-picker control that is on Google chrome browser. So, this means our end users have different experience depending on the browser they use. What we want here is consistency. There are many third party Date-picker controls that we can use, to provide consistent experience to our end users. ngx-bootstrap datepicker control is one of them. Step 2 : If you do not have Bootstrap installed, please install it using the following npm command. If you are following along we have already installed bootstrap in Part 1 of this Angular CRUD tutorial. So I am not going to execute this command again. Please note : We are usng Bootstrap 3. We can also use Bootstrap 4 with ngx-bootstrap. Please refer to the documentation available at the following link on how to use Bootstrap 4 with ngx-bootstrap. Step 3 : Once Bootstrap is installed, open .angular-cli.json file and specify the path to the Bootstrap stylesheet (bootstrap.min.css) in the styles property as shown below. Again, we have already done this in Part 1 of Angular CRUD tutorial. Change the "type" attribute value from "date" to "text"
Step 3 : Include a reference to the bs-datepicker.css file in .angular-cli.json file. 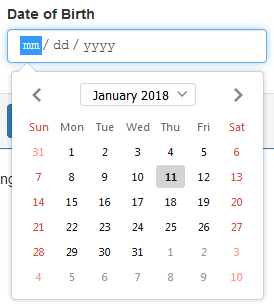 At this point when you view the page in Google chrome or Firefox, you get the same datepicker and hence the same experience. 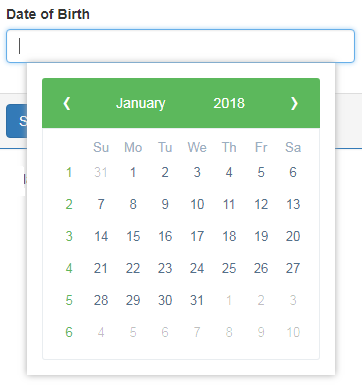 When we select a date from the date-picker control, the "Date of Birth" textbox is automatically populated with the selected date and it is also captured by the angular generated form model. With this datepicker control, it is also very easy to capture a date range. For example, you have an open job role, and you want to capture a date range for accepting CV's, we can very easily do this. All we have to do is use bsDaterangepicker directive instead of bsDatepicker directive on the input element as shown below. The above simple change, will display Daterange picker as shown below. 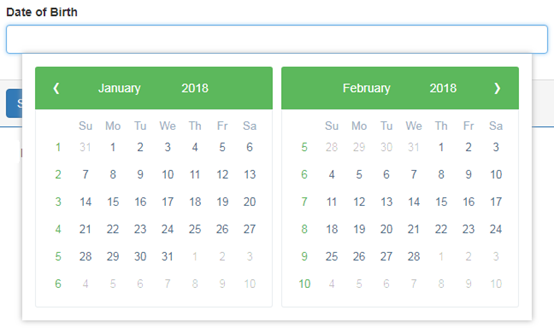 When we select a date range, the corresponding input field is automatically populated with the selected date range and it is also captured by the angular generated form model. At the moment, the Datepicker is using the default green theme. We want to change it to dark-blue theme, so it matches with the rest of the form. Datepicker is a highly configurable component. We will discuss how to do all of the above in our next video. could you please letme know how to solve this problem ??? how to validate in angular 4 datepicker ? ERROR TypeError: "this.scheduler is undefined"
Hi Venkat,encountered below prob when installed ngx-bootstrap. My bootstrap version is 3.3.7. Thanks for the wonderful video. I have got some error, when implement date picker please help. ERROR in node_modules/ngx-bootstrap/chronos/utils/type-checks.d.ts(8,62): error TS2304: Cannot find name 'Extract'. node_modules/ngx-bootstrap/datepicker/reducer/bs-datepicker.actions.d.ts(5,33): error TS1039: Initializers are not allowed in ambient contexts.